Very often, you will want a model for a specific purpose and you don't want a simple stand-alone molecular model. If you can imagine a molecular model and features that you want to accompany it, the chances are that we can build it. Simply tell us what you want, and we will do our best to help you. Many of our model types and model features are available now because a customer asked for them at some point and they became part of our standard products. 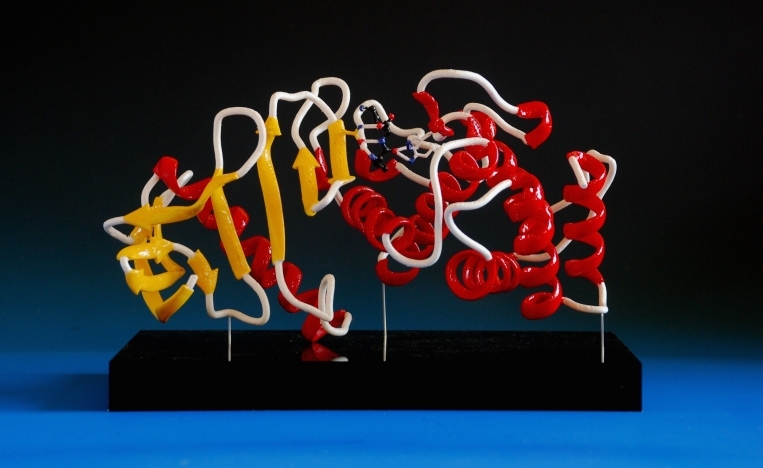 A six-foot molecular model of DNA? pretty straightforward. Lighting in the model base? No problem. An engraved plaque on a granite base? easy. Perspex models, brass models - even models made in precious metals or coated with metal film. In short, if you have an idea of what you want, no matter how outlandish or impractical you think it might be, talk to us. The chances are that we've either done it before, we know how to do it, or we know who to ask to find out how to do it. If you want something unusual, but don't know what you want, talk to us - we can almost certainly think of something that will give you what you are after. Take a look at our page of extra features that will give you a starting point for some of the things that we have done for our customers in the past. "Our job is not to give the customer what they ask for, it's to give them what they didn't realise they could have." Models made with balls of differing sizes.